I'm not very good at birthdays, but I want to say this. I was browsing Deborah Underwood's bibliography the other day and noticed that Pirate Mom came out on May 23, 2006. Which is ten years ago. Ten years ago today! Pirate Mom is the story of a pirate-loving kid, Marco, whose mom is hypnotised into believing she is a pirate, but the hypnotist is rushed to hospital before he can deprogram her. Obviously life becomes tough for Marco. Why am I so interested in Deborah's books? Because I'm her brother-in-law. You read that right. I'm the brother-in-law of the extraordinary Deborah Underwood, writer of many children's fiction books, for example The Quiet Book, Here Comes The Easter Cat, Bad Bye, Good Bye, Interstellar Cinderella, and (just out the other day) Good Night, Baddies. I didn't know when I married Deborah's sister what an extraordinary writer my sister-in-law was. That's mainly because neither did she. And not because she is modest (though she is) but because she didn't know she was a children's writer. To celebrate Deborah's 10 years of being an extraordinary children's fiction writer, I want to do two things. I want to say a few words about her life as a children's book writer. Then I want to pick out her best children's book and what makes it and her so awesome. I know what you are thinking: umm, you said it was 10 years, pal, that 20 years in the subheading is a typo! Ha. Ha. Ha. The sheer number of rungs on the ladder to becoming a successful children's author is simply astonishing. While it's 10 years since Pirate Mom, it's been a 20 year journey. The germ of becoming a children's fiction writer came to her when she read The Mousehole Cat (in the place of Mousehole itself in Cornwall: it's pronounced "mouzzal") and found herself crying over it. From that germ to being a published children's fiction book writer took about 10 years. I keep adding the word "fiction" because she published children's nonfiction first. She's published 28 nonfiction books for children. (Yes you read that right again, it's twenty-eight.) The very first was Northern Lights, published in 2004. I saw the Northern Lights for real a few months ago for the first time in my life, and I couldn't resist telling the people standing next to me that my sister-in-law had written a book about it! If I have counted right, she's published 19 fiction books for children. That's an impressive total. As a lover of counting, I can't help noticing that - with some more books in the pipeline, Deborah should pass fifty published children's books sometime in 2017. That's an awful lot of brilliant text for children to come out of reading The Mousehole Cat. That C.S. Lewis quote means a lot to our family, because exactly this happened with Deborah playing C.S. Lewis and my daughter playing Lucy. Remembering that the germ for children's writing happened in August 1996, and by 2002 a draft of Granny Gomez & Jigsaw was being read to my three year old and winning an honorable mention in a Writer's Digest Annual Writing Competition. I mean 6 years is a long time, but hey, you have to learn your craft. Well, yep, but the book was actually published eight years later in 2010. C.S. Lewis had it right. Another one which took almost as long was A Balloon For Isabel. Deborah started that one in 2004 and it also came out in 2010. Along the way the central character changed her name. She started out as Emily but then an unrelated book came out called Emily's Balloon. Emily had to go and she was replaced by Isabel. The name change was suggested by my other daughter, who was zero when the book was first written and about seven when it was published. Both these books are charming and highly recommended, by the way. Granny is the story of a lonely granny, who adopts a pig and sorts out their living arrangements. Isabel is about a porcupine who is desperate to graduate with a balloon instead of a boring old bookmark, and comes up with a solution to the age old porcupine-balloon-popping dilemma. They're both lovely but probably not Deborah's best book. So what is her best book? Let me move on to part 2, where I will tell you. Ok. I was lying. I can't possibly pick out her best children's book. There are so many extraordinary ones. Can we call it a tie? I don't know. But each of the following demonstrates Deborah's extraordinariness in a different way. The Quiet Book is about quiet. But based on a deep insight, that there is not just one type of quiet but many. The quiet when you are waiting for a concert to begin is not the same as the quiet when you are the last one to picked up from school, or when you are with your best friend and you don't need to talk. What this book showed, as do many of her others, that Deborah knows the rules but knows how to break them. Being "too quiet" was and is a standard phrase used to reject children's books. Indeed, the rule-breaking of The Quiet Book meant that it was rejected by several editors before Deborah managed to sell it on her own, but the good news is that it found the right home in the end. The editor who did pick it up paired Deborah's quiet text with amazing pictures. Part of the success of The Quiet Book are the wonderful illustrations by Renata Liwska. If you're not in the children's book business, you might not realise that the writing and illustration of books are usually completely separate (unless the author and illustrator are the same person.) The writer just submits text, with no illustrations and as few hints as possible about the illustrations. Typically the writer doesn't even choose the illustrator, that would be the editor at the publisher. In this case, for example, everyone fell in love with Renata's adorable animal illustrations, which Deborah had never imagined. The book ended up on the New York Times bestseller list. Two sequels followed, The Loud Book and The Christmas Quiet Book. Both excellent and successful of course. Though don't get carried away with what success means in children's publishing. As one of her friends said, he thought that becoming a NYT bestselling author meant you had an ATM printing money in your apartment. Not so. Deborah's success - a very real and tangible reward for 20 years of hard work, tenacity, and brilliance - has been so high that she has not had to move out of her single bedroom apartment in San Francisco. (Though it's only supported her in this dazzling lifestyle because the apartment is rent controlled). If you've ever read about J K Rowling's wealth, I mean it's wonderful, but not common. In Here Comes the Easter Cat, the author is speaking to a Cat around Easter time who is upset at the attention the Easter Bunny is getting, and decides to take over. Cat has an attitude which the author has to try to work around, but in the end it works out. You know I said that writers don't submit illustrations? And that Deborah knows when to break the rules? Yep, Deborah drew draft illustrations for the Easter Cat. It just happened that she was talking to Cat and Cat started answering back by holding up signs. They were such an integral part of the story that she had to include them - instead of just including extra text like "cat holds up sign with picture of ..." The illustrator Claudia Rueda used those as a starting point, though of course making the illustrations her own. Also, by the way, the book was far longer than picture books are expected to be. Another rule she knew how to break. And it worked because it works and kids love the book. Like Quiet, Cat has led to a series, with Santa Cat, Tooth Fairy Cat, and Valentine's Cat, with more to come. The interaction in all of these between the Cat and the author/narrator is beautiful. But as per usual, Deborah knows how to break the rules. But somehow, and I doubt even Deborah knows why, it works for Cinderella. 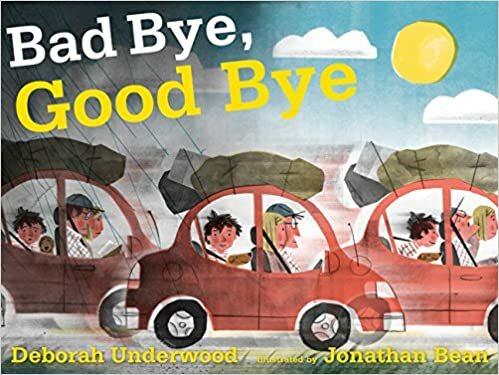 Bad Bye, Good Bye is about the pain of leaving when your family pack you in the car to move across the country. And the fact that maybe things will be ok in the end. The book has 80 words in it (I don't mean 80 different words, I mean 80 words.) Of those 79 are single syllable words and the eightieth is the barely polysyllabic "stuffed". The 80 words come in 10 sets of 8 words, each set a rhyming couplet of two pairs of 4 words. And the 4 words themselves are in two pairs of two words each. There are no verbs. Just to put it in context, this paragraph itself is longer than 80 words. Ok this is starting to sound confusing, but honestly it isn't. The 80 words in that complicated structure tell a beautifully simple story with a beginning, middle, and a happy ending. The first 10 years of Deborah's publishing as fiction author have neatly finished with the release last week of Good Night, Baddies. What do fairy tale villains do at night? I mean they have a hard day persecuting Princesses and people called Jack, and what are they going to do to rest? Why, they will meet up and share stories of the day while getting ready for bed in their shared pad. Then get a good night's rest, and then get on with it the next day. By the way, Baddies also rhymes, but you're fed up of me talking about Deborah breaking the rules by now. In fact the text makes a lovely song, and you can hear Deborah's beautiful singing voice in the trailer she made (yes apparently "Book trailers" are a thing now.") And you can even have her sing the whole book to you as a lullaby if you want! But I do want to add one reason I have a particular soft spot for Baddies. Deborah said that one of the inspirations for it was hearing me talk to my daughters about "baddies", since we live in Britain and that's a less common phrase in the US. Ok I have no idea which is Deborah's best book. And I haven't even mentioned some of Deborah's classics. Like Part-time Princess, about a little girl who has adventures at night such as putting out fires caused by a dragon who she then invites to tea. Or an entire six book series, the Sugar Plum Ballerinas about a ballet class in Harlem, co-authored with Whoopi Goldberg (yes, that Whoopi Goldberg.) When they auditioned for a co-author and Deborah was picked, she was shocked that they had signed her for the entire six book series. I told her it was natural because either the first book would flop in which case there would be no series, or it would be a success and why would they want anyone else for the later books? Of course it was a success. The Secret Part 3: Secret Deborah Underwood Books. There are Deborah Underwood books that I have read almost nobody else has. How lucky does this make me? Very. There must be others but the ones that spring to mind are Sarah Visits The Teletubbies, The Purple Hat, Ojo's Birthday Treasure Hunt, Penguin Aloha, Baby Again, and perhaps the most special of all, Pizza Rat. Our copies of these books are for sale by the way, if you make me a good enough offer. Sadly, you can't afford a good enough offer! I can imagine you are thinking, how can I emulate Deborah Underwood's success (what with the rent controlled apartment and everything)? From outside I can comment with no confidence at all that here are three key tips. It's a ridiculously long road. The number of steps is incredible, so you need stickability and dedication, and the desire to do it even though it's almost certainly an objectively bad idea. Don't try to copy Deborah's or anybody else's style, you need to have your own. You need all the support you can get. On the last point, here is something Deborah wrote to family and friends 10 years ago today, when Pirate Mom came out. "I want to take this opportunity to thank all of you for your support during this five-year (!) process. I feel incredibly fortunate that all the people in my life have championed this somewhat-insane career change. Without your encouragement, I certainly would have thrown in the towel long ago. So thank you!" It's been a pleasure to be a spectator and borderline participant on the journey. Thanks Deborah. Fabulous post about a fabulous writer, and the additional advice is a bonus! Will share with my writer colleagues immediately! Cheers! Thanks Jilanne. I'm not a writer so the advice is probably wrong. But thanks for the kind comments! Wow and double wow. Such creativity! I must make an urgent trip to the library. Just put a number of DU's older titles on hold at the library. Thanks for reminding us of these accomplishments, and of the long journey. Congrats to Deborah! I need a brother-in-law like you, Ian. Nice tribute to Deborah. I've read -- and love -- the recent books. Now I'll follow Julie Rowan-Zoch's lead and seek out the older ones from the library.